Automatically detects squeegee and starts sharpening. 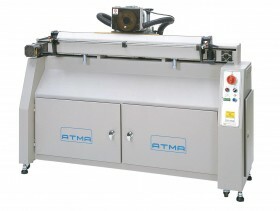 Motor-driven shuttle sharpening head stably travels along linear rail for perfect straightness. Motor-driven diamond wheel with dual fineness provides vibration-free sharpening. The individual automatic adjustment of revolution, course-fine sharpening time, and feed-in depth provide perfect sharpening quality. Easy-opening squeegee-holding jaw adjusts for various thickness of squeegee rubber, also allowing for angular sharpening. Strong vacuum at sharpening head removes debris to keep worksite clean. Max. sharpening Stroke 70mm 28" 100mm 40" 150mm 60" 200mm 80"
Squeegee Thickness 5-10mm ¼-½" 5-10mm ¼-½" 5-10mm ¼-½" 5-10mm ¼-½"
Squeegee Outcrop Length 18mm ⅞" 18mm ⅞" 18mm ⅞" 18mm ⅞"
Clamp Height 75-120mm 3-4⅝" 75-120mm 3-4⅝" 75-120mm 3-4⅝" 75-120mm 3-4⅝"
Clamp Width ≤50mm ≤2" ≤50mm ≤2" ≤50mm ≤2" ≤50mm ≤2"
Squeegee + Clamp Height ≤130mm ≤5⅛" ≤130mm ≤5⅛" ≤130mm ≤5⅛" ≤130mm ≤5⅛"
Machine Dimensions 136mm x 60mm x 128mm 54" x 24" x 51" 166mm x 60mm x 128mm 66" x 24" x 51" 216mm x 60mm x 128mm 85" x 24" x 51" 266mm x 60mm x 128mm 105" x 24" x 51"